We’re heading into the business end of the season, and I can honestly tell you that it’s been a long time since I have felt this good as a Liverpool supporter. Every time the lads step on the pitch, I genuinely expect dominance followed by a victorious result. This team given me every reason to dream once again. Watching this club play football is a joy, and objective fans will agree that Liverpool deserve its place amongst the top four English clubs this season. It used to be that I would settle in to watch the match, each time feeling nerves for various reasons depending on the opponent. This nervousness seemed to generate near the end of Brendan Rodgers reign as Liverpool failed to put matches to bed conceding a late equalizer. Perhaps it is the triple threat attack with Mane, Firmino, and Salah that puts my mind at ease at kickoff. Maybe it’s the improvement in defensive look with the recent addition of Virgil van Dijk to the roster. Mostly I believe it’s the way we play under Klopp: relentless with attitude. His “heavy metal football” is a delight. I no longer get nervous when the Reds take the pitch. I no longer worry that they won’t be able to hold the lead once we go on top. It’s a great feeling to have rediscovered the strength that came with being a Liverpool supporter, with the ability to feed off the fear that every opposing fan now exudes when they faced our beloved Reds. As we impatiently await the conclusion to the season’s final international break, I thought about some of the impressive score lines produced by Liverpool this season. Fifteen teams this season we have beaten our opponents by at least three goals. That’s one out of every three matches, we are dominating the scoreboard. It helped me theorize that Liverpool can dominate because of scoring the early goal, thus preventing the standard “park the bus” defense that some clubs attempt. Once they get a lead, the opposing strategy crumbles as Liverpool cruise to an easy victory. It’s not rocket science, this theory of mine. But I decided to see if the data supports it anyway. Suffice to say that it’s been a widely entertaining season thus far, one for the history books. Including all competitions, Liverpool have played 44 matches thus far this season. Three of those matches ended in nil-nil draws. Of the remaining 41 matches, Liverpool have conceded the first goal in ten while drawing first blood 31 times. That’s simply remarkable. Three of every four matches played, Liverpool will put the ball in the net first. But does that first goal necessarily translate into victories at the final whistle? Let’s dig a little deeper to find out. In those ten matches where Liverpool conceded first, we only came back to win once. That was during the home match back in December when Jamie Vardy scored in the third minute to give Leicester City an early lead. It took two second-half goals from Mo Salah to give the Reds the 2-1 victory in that match. Four other times we conceded first we would come back to eventually earn a draw: at Watford (3-3 while conceding a late injury-time equalizer), home to Sevilla (2-2), home to Burnley (1-1), and at Spartak (1-1). That’s only seven points earned in ten matches, or a paltry 0.7 points-per-match (PPM). 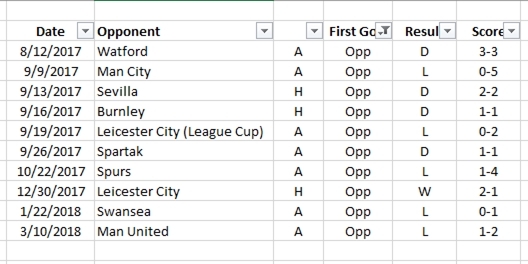 Note that only three of those ten matches were played at Anfield, and in each of those matches we were able to avoid defeat. The other seven matches were away from home and resulted in only two draws salvaged while suffering five defeats. It should be noted that one of those defeats was in the League Cup match at Leicester City where Liverpool started a defensive back four of Ragnar Klavan, Jon Flanagan, Joe Gomez, and Andrew Robertson (in his third match ever played for Liverpool). Also starting in that match were Marko Grujic in the midfield and Dom Solanke up front. Not exactly our best eleven at the time, so it’s easy to toss that example out of the analysis if you wanted. There is a silver lining to consider with this alarming statistic when conceding the first goal. Look at the dates of the matches when that happened. Seven of those matches where the opponents scored first happened before the end of October in our first fifteen matches of the season. That’s nearly once every other game where Liverpool’s defense would concede first strike to the opponent. After that tough 4-1 loss to Spurs at Wembley on October 22nd, Liverpool have managed to tighten up the defense and only concede the first goal three times in the last 25 matches played. 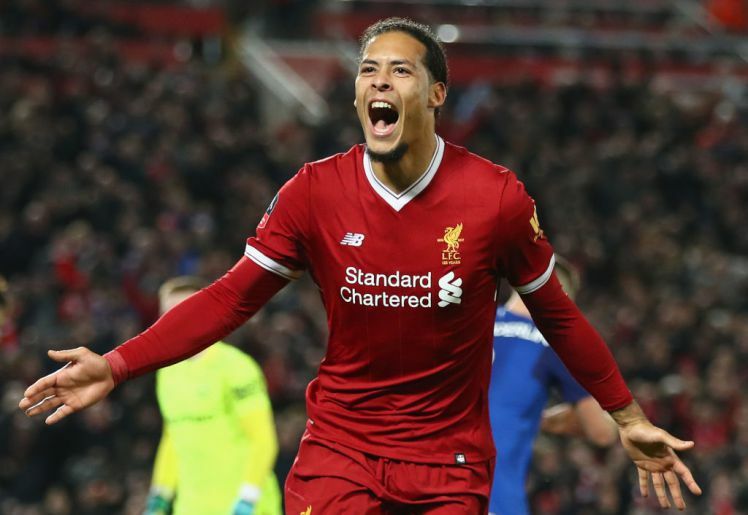 It obviously helps that we have added one of the world’s greatest central defenders in Virgil van Dijk this past January. The other notable move made by Klopp was naming Loris Karius the permanent #1 keeper relegating Simon Mignolet to the bench around the same time. Overall those moves seem to have helped tighten up the defense considerably. Recent trends have shown great improvement in this area which now see us conceding first only once every eight matches. Long may that continue!! Liverpool have scored first exactly 31 times this season to date in the 44 played. Of those matches, Liverpool have gone on to win 24 times while drawing six and losing once. That sole loss is an inexplicable outlier with the home FA Cup defeat to West Bromwich Albion back in January. Take that match as the exception to the rule, as Liverpool are posting a stellar 2.52 PPG on pace to collect 96 points in a full 38-match season. The fact of the matter is that Liverpool get the job done when they open the match account. Watching the Reds dismantle Watford 5-0 on Saturday got me wondering more about WHEN they score their goals and exactly how that affects the final outcome. Salah’s brilliant right-footed strike in the third minute completely took Watford out of their game plan, opening the door for the ensuing onslaught. It seems once they put the first goal on the scoreboard, the opponent’s game plan crumbles and the flood gates open. I hypothesized that Liverpool would likely win big when they could score in the first ten minutes of the match. Let’s take a look. Scoring in the first ten minutes with the opener is something that Liverpool have done in exactly ten matches to date. Seven of those ten resulted in comfortable victories, while the other three times the surreal took over. The only defeat was that crazy FA Cup match against West Brom, where Firmino’s 5th minute goal was quickly erased and turned into a deficit by the Premier League’s last place team. The other two results were draws snatched away from victory. First was the miracle at Sevilla when Liverpool couldn’t hang on to a 3-0 halftime lead (Firmino had scored in the 2nd minute of that one). The other draw was the infamous late penalty against Spurs when Jon Moss suddenly discovered that he had no ball sac, allowing assistant ref Eddie Smart to overrule his initial (and correct) wave-off of an Erik Lamela dive. Take out those three mad results, and Liverpool win by an average of more than four goals when they score in the first ten minutes. Extend that initial period from the first ten minutes to twenty minutes, and the win total increases to eleven… still with an average goal differential of four. Think about that for a second. Every time Liverpool open the match scoring with a goal in the first 20 minutes, they win 78.5% of the time by an average of four goals. 14.3% of the time they still earn a point. The other 7.2% of the time they lose. And even then I’m not sure that it’s a fair representation to include the West Brom match in this analysis. Be that as it may, the numbers are still impressive. So what happens when Liverpool doesn’t score in the first twenty minutes of the match? Should we start to worry? The longer a match goes scoreless, the more tense supporters tend to get. But should we? In matches where Liverpool wait until the latter stages of the first half to score the opener, they still have won nine times and drawn only three. Those nine victories were by an average of 2.5 goals. So apparently they just don’t have as much time to pop more goals into the back of the net. One important takeaway is that Liverpool have not lost a match this season when taking a lead into halftime. Eight times this season Liverpool have gone into halftime at nil-nil. Four of those eight resulted in victories (Crystal Palace, Huddersfield Town, Maribor, and Burnley) with second-half goals while four resulted in draws (Chelsea, Man United, Burnley, and a meaningless second leg with Porto). It may end up being tense nervy times as the second half is being played, but so far we have managed quite well. What conclusions can we draw from this analysis? Don’t concede first, especially on the road. If we do then it will be a struggle to finish with a result. Conceding first at home is still bad, but we are more likely to get something out of the match when that happens. The good news is that we’ve only conceded the first goal three times since late October, or 29 total matches. That’s only 10% of the time, and one of those three matches we came back to win all three points. We are better defensively with Virgil van Dijk on the pitch. Because duh… But the statistics do back up this claim. Score early, and we’ll score often. If Liverpool bag a goal in the first twenty minutes, expect a rout of at least four goals or more. Eight times Liverpool have beaten an opponent by more than three goals. Only the 5-1 away win at Brighton did they wait until the 30-minute mark to score their first goal with Emre Can’s header off a corner kick. If the score is nil-nil at halftime, chances are we’ll still get a result. With four wins and four draws in these matches, that’s exactly 2.0 PPG and enough to see us through to the top four. Seven matches remain and Liverpool sit firmly in third place at 63 points. We are currently seven points clear of fifth place Chelsea, the only team that can knock us out of the top four. It’s true that they have a game-in-hand, but we’ve already got points-on-the-board. With the early kickoff on Saturday at Crystal Palace, Liverpool have a chance to put double-digit points between them and Chelsea. The next day the Blues travel to play Spurs at Wembley in a match that mathematically helps Liverpool regardless of the result. After that, the remainder of the schedule favors Liverpool with only two matches against teams not trying to avoid relegation. But until that time, we simply need to focus on Crystal Palace after the international break concludes. We can’t look past them. Woy Hodgson has made a habit of screwing Liverpool, and he’ll continue to strive towards that objective. We need to take care of Palace first, then we can watch Spurs and Chelsea battle it out and shift our focus to those baby blue Mancs in the Champions League. Score first, early and often. Start VVD. Win big. The plan really is as simple as that.